THE SLIVER OF MOON did nothing to brighten the frigid dark of 5:30 a.m. on the side of Dead Man Peak. Sitting on the cold, hard ground, I was living out the dream of a lifetime. But it wasn’t my dream; it was my husband’s. To hunt an elk with a bow and arrow, for its meat. Any quiet activity in the wilderness is my idea of heaven, so there I sat waiting with him. The silence was intense. I dared not disturb it if we wanted the big game animal we felt sure was nearby. 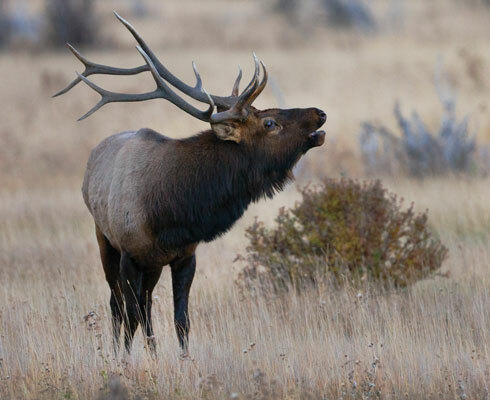 Elk are said to have incredible powers of hearing and smell and will run off at the slightest indication of humans. Every little ache that would normally be relieved by a simple shift in body position demanded movement, and every tiny movement seemed to echo through the valley. As the day began to warm, I needed to remove one of my jackets. Most people will never realize just how loud Velcro can be. Over several days of scouting, I had spotted only one elk, and Skip had seen none, and it was beginning to appear that this morning would bring more disappointment. Could my tiny movements have alerted the elk to our presence? A fighter jet flying silently a mile above caught the early rays of the sun and did a complete roll directly overhead. It was as if even the pilot had spotted our hidey-hole. We decided we weren’t going to wait any longer. As I got up to leave, I glanced down at the disturbed dirt at my feet and spotted a small arrow- head. We weren’t the first to hunt here. Our camp was on the edge of a sage-studded valley lined on the far side with tall, jagged cliffs a quarter-mile away and surrounded on the remaining sides by a pine-juniper-and-oak forest. The dense forest rose steadily eastward through layers of piney ridges until it reached the top of huge Gallina Mountain. The far side of the mountain cascaded down over massive wood-covered mesas to the Chama River Canyon Wilderness, a vast river valley lined with massive pink and yellow cliffs. This was truly wild, beautiful country. During our scouting before the hunt, I had noticed small white ribbons tied to some of the trees. The area was heavily wooded and beautiful, and the ribbons had me worrying that these trees were being selected to cut. A resupply trip to Cuba included a trip to the Forest Service, where we learned the ribbons had been put there by archaeologists to mark pit houses and rock-mound Native ruins, now hidden by vegetation. There were over a hundred sites in the valley where we were camped. The day before the hunt, we had finished our scouting and had a day to fill with whatever struck our fancy. We had visited several of the more noticeable ruins near our camp in past years, but I was almost sure there was one above the cliffs across from us. We set off to check it out. Sure enough, it was a big ruin, and two hours later we had found three more ruins and an arrowhead. There was a water tank shown on the map where we could check for elk sign, so after lunch we headed up the rutted road to look for it. When we stopped to investigate a muddy hole in the road for tracks, I heard a funny shout over by the trees. It sounded like a man, but then more like a growl, then a screech, then a snarl. It was only a few hundred yards away. Suddenly, it sounded terrifying. Then it sounded like something caught in a trap begging for help. I wanted to go help whatever it was, but soon we determined it was a mountain lion in some sort of distress and not likely to appreciate our presence. Later we learned we’d had the rare fortune to hear a pair of mountain lions mating. The second day of our hunt, we decided to penetrate the heavy woods on the hill behind our camp. Sure enough, we found a lot of fresh tracks. Skip sat under a pine tree in some oak bushes. I found a spot 50 feet behind him, with my back against a tree. A half hour went by and, other than Skip’s occasional elk call, the woods were deathly quiet. Maybe if I closed my eyes, my other senses would notice more. My mind began to wander. What did the previous tenants of these woods eat? We knew from the brochure at the ranger station that they had grown corn. Had there even been any elk here then? With so many ruins, it’s unlikely that big animals would have thrived in a high-population area. Suddenly my nodding head jerked me awake. Guiltily, I glanced around and there were two elk eating oak leaves just feet from me. I froze. They were to Skip’s back, and he had no idea they were there. To get his attention, I pushed my radio’s vibrate button, hoping they wouldn’t see the tiny movement. Skip turned to see what I was signaling about, but I was afraid to point. Just how motionless can one sit and still breathe? Skip finally noticed the pair, but didn’t have a shot. Within a few breaths, they pranced away through the bushes. 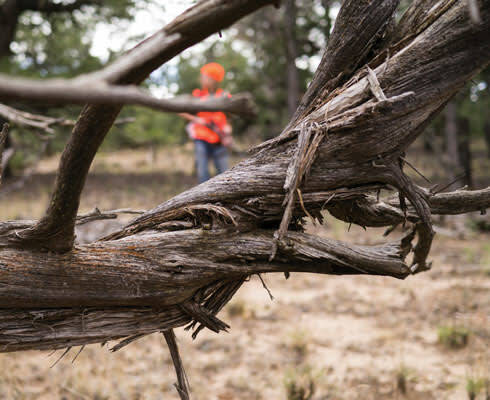 On our final day to hunt, one place we hadn’t tried was a wide, sage-covered valley south of our camp. The south end of it led to the Gallina River before it entered the Chama River Canyon Wilderness. It was a sunny afternoon when we headed out. Suddenly the hint of a faint elk bugle reached my ears. Just as we determined its location, a Harrier jet from the Air Force base 100 miles to the south flew over us, treetop high. The harrowing sound of the engines swept down the valley as the pilot did a friendly wing wave just above our heads. He probably couldn’t make out our responding gesture. This place has such a wild, ancient feel to it, the plane definitely felt out of place. No elk would hang around after that. Guess we’re going to go without elk meat this year. But where else could a person sit in the midst of ancient Indian ruins while hunting game and be buzzed by a military jet? Only in New Mexico. —Jade Halterman resides in Navajo Dam.